Among Fort Wayne preservationists, there's probably no sadder story than that of the Noll mansion, which for six decades dominated the landscape at 2500 S. Fairfield Ave. 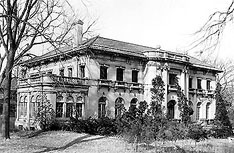 The marble and stone mansion was built in 1916 and was paid for with money earned from an old cough syrup formula. William H. Noll in 1905 formed the Pinex Co. to market a cough syrup which was sold through his father's drug store. By 1910, the cough remedy was distributed nationally. By 1913 Fort Wayne's cough syrup was sold abroad. And although the sales zenith didn't come until 1920, William Noll was rich enough by 1916 to erect this sumptuous edifice, which reportedly cost more than $1 million to build. Life at the Noll house was an exercise in luxury. The Nolls were famous for their lavish parties and manicured lawns and garden. The ornately carved rooms and plush furnishings oozed an aura of wealth which soon became an anachronism. The years passed and the Noll house gradually fell into disrepair then outright neglect. By 1960, weeds and unmowed grass had replaced the sculptured lawn. Finally, the house and lands were purchased by the Fairfield Church of the Nazarene. By the time the old Italianate walls came down in 1974, it was almost a blessing. Today just the old carriage house is left of a manor which once boasted gold fixtures, a ballroom, a fountain and countless other luxuries. The Noll house was razed before the preservationist movement in Fort Wayne really began, to the everlasting disappointment of people who think such monuments to the past are worth saving. The Noll house may have been built by cough syrup, but for some, it's demise was a hard pill to swallow.